Kevin Smith is Vice President of onshore corporate services for ImpactWeather, A StormGeo Company. For nearly a decade, Kevin has directed ImpactWeather’s meteorological operations team. ImpactWeather is a full-time weather department for hundreds of corporations globally, providing site-specific forecasting, monitoring, alerting and business continuity tools that empower clients to make the smartest business decisions when faced with weather-related challenges. For more information, please email ImpactWeather at sales@impactweather.com, or visit www.ImpactWeather.com. What does this mean for the construction industry? Quite a bit. According to Forrester Research, weather is the leading cause of business disruptions.1 No other industry is as susceptible to weather’s unpredictability as construction workers who operate outside. High winds from thunderstorms and tropical developments create hazardous environments for crane workers and equipment stacks if site managers do not shut down before winds have reached the location’s operational thresholds. Lightning strikes are also a major headache for outdoor workers. According to the Federal Emergency Management Agency (FEMA), lightning often extends laterally for many miles, meaning it can pose a great danger to individuals outside even if a storm is not directly overhead. Even one disruption from thunderstorms, lightning, or a tornado, can have a domino effect on the rest of the supply chain, which can cost thousands of dollars in downtime and profit leaks. The Atlantic Hurricane Season may produce up to 9 named storms, 4 hurricanes, and 1 intense (category 3 or greater) hurricane. Construction sites that are not properly secured from a major storm could experience delayed or indefinite completion dates, which can eventually cost them their reputation or their next job. Extremely high temperatures put personnel in danger of heat-related illnesses, including exhaustion, fainting, rash, cramps, or worse, stroke. Near coastal environments, heat combined with humidity can further damage the human body since humidity reduces the amount of sweat that the body needs to cool off. From scheduling delays to reduced personnel safety, legal liabilities, and profit leaks, summer wreaks havoc on even the most seasoned of construction workers. There is a way to avoid such weather interferences. For heat disturbances, there are several internet-based indices available to provide data; however, in situations where humidity contributes to life-threatening situations, a more detailed assessment is needed. In environments with extreme humid conditions, the proprietary Modified Discomfort Index (MDI) is a tool used by many companies as part of their Heat Injury Prevention Plan. To calculate MDI, construction site managers add ambient (air) temperature (Ta) to wet bulb temperature (Tw), which is found via local weather reports. The formula is as follows: MDI = (.3 x Ta) + (.75 x Tw). Encourage self-monitoring where employees can take personal breaks if they feel overheated. 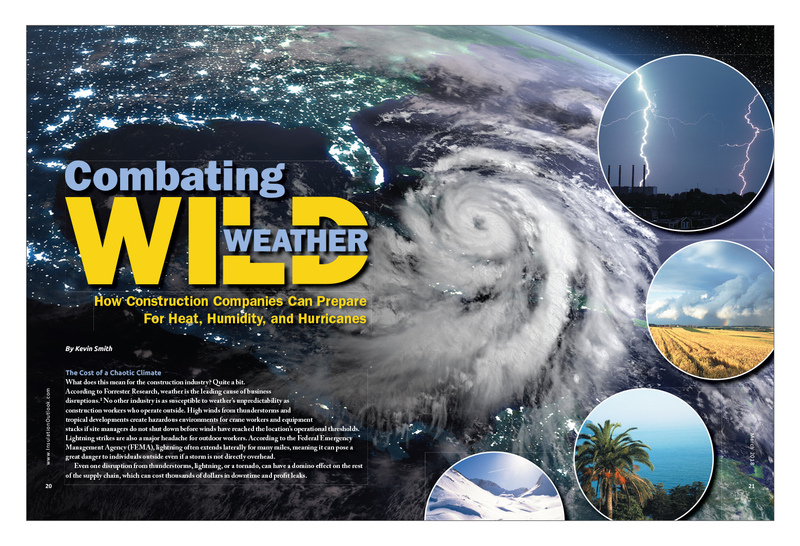 While summer’s clear skies are a desirable time of year to work on construction projects, these assignments are routinely disrupted by hurricanes, tropical storms, and thunderstorms, producing high winds. By implementing the following timed phases for efficient operational shut downs, companies can safeguard personnel, reduce profit losses, and return to work as quickly and efficiently as possible. Determine a shut down timeline—Often businesses decide on evacuation plans based on when a hurricane makes landfall. This can be dangerous as damaging winds may arrive up to 12 hours before the storm. Recently, many workers have determined shut down based on wind strength. For example, if a site cannot safely work with winds in excess of 48 mph, they will shut down. Identify resource needs—Identifying a site’s resources is an opportunity to see what employees, products, equipment, and supplies the project has available or needs to address prior to shutdown. What is the facility’s operational schedule for the next couple of days and who will be affected? Does the company need to facilitate deliveries to and from the site? In the event of damage, does the site have a vendor or team who can clean up the location? Based on recovery efforts, how quickly can employees return to work? Communicate with key team members—Key team members are clients, employees, vendors, corporate executives, local government agencies, and supply-chain workers who will be affected by the site’s delays and/or closures. On-site managers should have each of their employee’s and contractor’s personal contact information to communicate critical updates following a storm. Release non-emergency personnel to evacuate—If there is a team that needs to assist with shut down until the arrival of the first threshold, they should have already attended to their personal plans. Continue site shutdown—No additional deliveries should be made during this time. The construction zone can continue its protocol for shutting down and removing any non-essential product and supplies. Continue monitoring the storm—This is the time to review a project’s worst-case-scenario to maintain the safety of personnel and equipment. Facilitate a final walkthrough—This is the last chance to secure or transport outstanding materials. Place vendors on standby—Storm surge, high winds, and hurricane-producing tornadoes could damage a construction site. Managers should advise their clean-up vendors to be on standby. Evacuate—Remaining personnel and management should evacuate. Mark Twain once said, “Climate is what we expect, weather is what we get.” Even though construction workers can’t guess the weather’s next move, these business continuity tools can help workers avoid monetary penalties from lengthy delays and more importantly, protect outdoor personnel from weather’s unpredictability. 1. Forrester Research, Inc. (Q4, 2011). [151 Global Business Continuity Decision-Makers and Influencers Who Have Had to Invoke a Business Continuity Plan]. Disaster Recovery Journal Business Continuity Preparedness Survey. Originally published at www.constructormagazine.com. Reprinted with permission from Constructor, a publication of the Associated General Contractors of America.